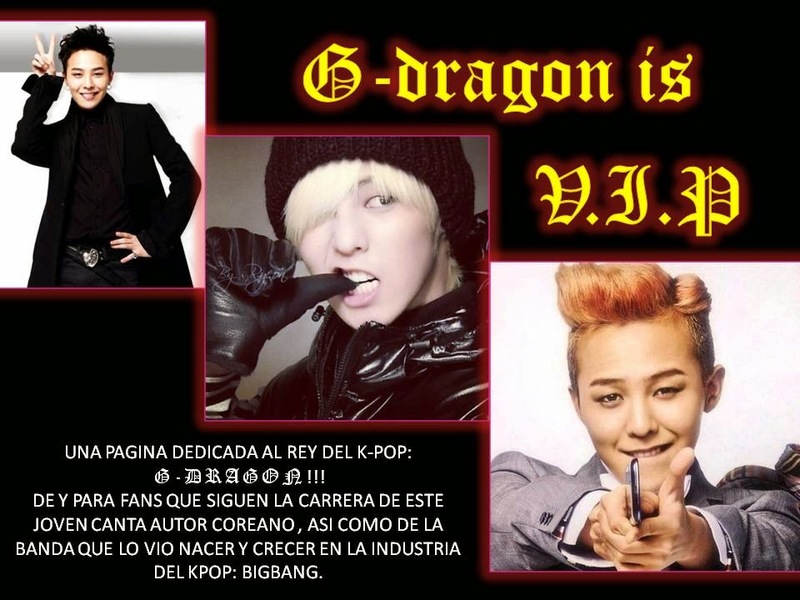 G-DRAGON IS V.I.P: BIGBANG:" ALIVE TOUR: THE FINAL"
VIP´S COMO ESTÁN ?? 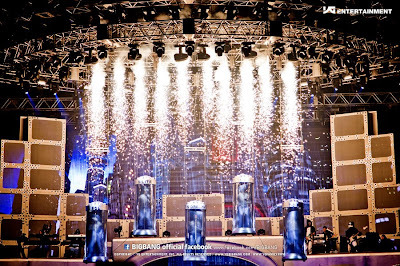 PUES COMO YA SABEMOS EL DÍA DE AYER SE CELEBRO EL ULTIMO CONCIERTO DE LA GIRA MUNDIAL DE BIGBANG EN SEUL.... QUE TRISTE!!!! 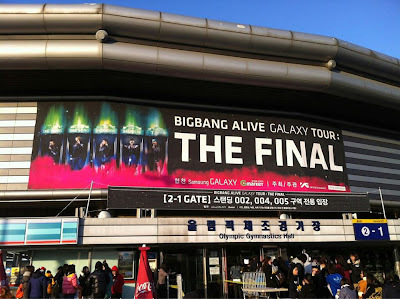 LOS CHICOS CONCLUYERON SU TOUR EN EL ESTADIO OLÍMPICO DE SEUL ANTE MILES DE FANS COREANAS Y DE VARIOS PARTES DEL MUNDO. CADA UNO DE LOS CHICOS AGRADECIÓ A TODAS LAS VIP´S QUE ASISTIERON A CADA UNO DE SUS CONCIERTOS EN LOS DIFERENTES PAÍSES QUE VISITARON. DIERON LAS GRACIAS POR TODO EL APOYO Y MOR QUE RECIBIERON EN CADA PRESENTACIÓN. REALMENTE LOS BANG´S TIRARON LITERALMENTE LA CASA POR LA VENTANA CON ESTE ULTIMO CONCIERTO, DIERON EL 1000% DE SUS ENERGÍAS!!!! DURANTE LA CONFERENCIA DE PRENSA GD COMENTO: "REALMENTE VOY A EXTRAÑAR EL TOUR, APRENDÍ GRANDES COSAS DURANTE TODAS LAS PRESENTACIONES Y CREO QUE CRECIMOS MUCHO COMO ARTISTAS"
DAESUNG: "TENGO QUE CONFESAR QUE AL PRINCIPIO NO PENSABA QUE EL TOUR TUVIERA ÉXITO, PERO CONFORME ESTE IBA AVANZANDO PUDE VER QUE ESTABA EQUIVOCADO"
SEUNGRI: "FUE IMPRESIONANTE SABER QUE NOS PRESENTAMOS ANTE 800 MIL FANS"
T.O.P: "DURANTE ESTE AÑO PUDIMOS VER COMO FUE CRECIENDO LA POPULARIDAD DEL KPOP EN TODO EL MUNDO, ESTO NOS HACE PENAR EN LA GRAN RESPONSABILIDAD QUE TENEMOS COMO ARTISTAS CON LOS FANS DE TODO EL MUNDO"
TAEYANG: "LA GIRA SOLO NOS DEMOSTRÓ EL CAMINO QUE TOMARA EN UN FUTURO BIGBANG EN LA MÚSICA"
GD CONFESO QUE LOS LUGARES QUE LE IMPRESIONARON MAS FUERON PERU Y MALASIA YA QUE NO HABIAN TENIDO OPORTUNIDAD DE PRESENTARSE EN LUGARES ABIERTOS, EL HACERLO EN ESTOS PAÍSES LOS HIZO SENTIRSE COMO EN UN FESTIVAL DE ROCK. ADEMAS DE ESTAR IMPRESIONADO DE OÍR CANTAR A MILES DE FANS DE OTROS PAÍSES EN COREANO: "CREO QUE AHORA NO TENGO DUDAS EN QUE LA MÚSICA COREANA NO TIENE FRONTERAS, Y ESTOY MUY ENTUSIASMADO EN REALIZAR MÚSICA QUE SE ESCUCHE EN TODO EL MUNDO" COMENTO G-DRAGON ANTES DE SUBIR AL ESCENARIO EN SEUL. 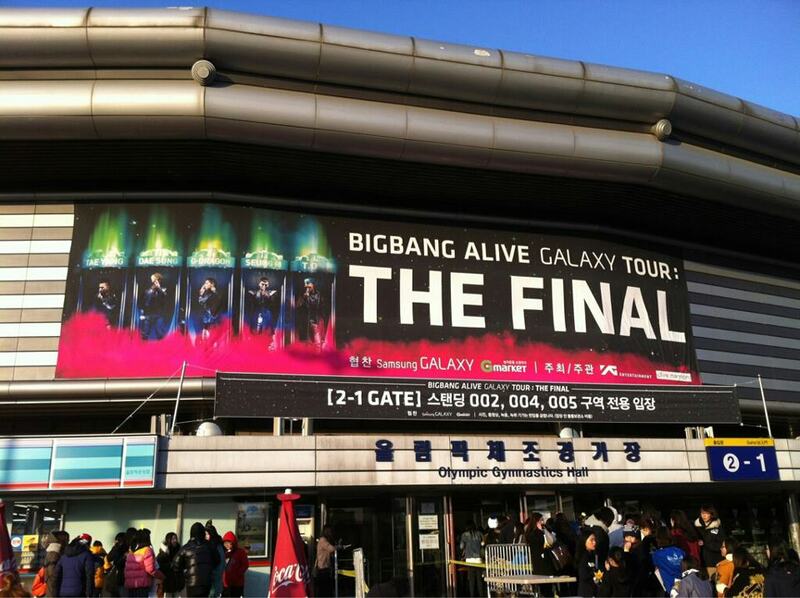 LAS FANS COREANAS NO SE QUEDARON A TRAS YA QUE DEMOSTRARON SU GRAN A MOR POR LOS 5 CHICOS AL COREAR CADA UNA DE SUS CANCIONES Y AL REALIZAR VARIOS EVENTOS PARA DESPEDIR LA GIRA, ADEMAS DE REGALARLES UN HERMOSO PASTEL!!!!! PUES A PESAR DE QUE ESTE 2013 NO TENDREMOS EL GUSTO DE VERLOS COMO AGRUPACIÓN PODEMOS DISFRUTAR DE CADA UNO EN SUS PROYECTOS COMO SOLISTAS, YA QUE GD SACARA NUEVO ÁLBUM Y COMENZAR SU TOUR MUNDIAL COMO SOLISTA, DESUNG SACARA SU PRIMER ÁLBUM Y GIRA EN JAPÓN TAEYANG SACARA NUEVO CD Y TOP NO DELEITARA CON UNA NUEVO PELÍCULA.